The amniotes of the Late Carboniferous include about 25 genera of small- and medium-sized insect-eaters. During the Permian, amniote diversity expanded enormously, and the main lines are documented later in this chapter. But what was it that set amniotes apart from the other basal tetrapods? The key features are to be seen in their eggs and their skulls. Fig. 5.4 The cleidoic egg,showing the semipermeable shell and the extraembryonic membranes. and because the young are protected from predation to a much later stage in development. Reproduction also takes place on dry land, so that internal fertilization is essential. 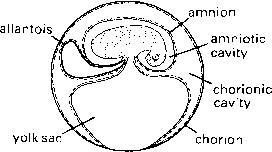 The egg of amniotes, called the amniotic or cleidoic (literally 'closed') egg (Figure 5.4(a)), has two key features. 1 A semipermeable shell, usually calcareous,but leathery in snakes, some lizards, and some turtles, which allows gases to pass in (oxygen) or out (waste carbon dioxide),but keeps the fluids inside. 2 Extraembryonic membranes, specialized membranes that lie 'outside' the embryo, the chorion, am-nion and allantois. The chorion surrounds the embryo and yolk sac, whereas the amnion surrounds the embryo with water. Both function in protection and gas transfer. The allantois forms a sac that is involved in respiration and stores waste materials. As the embryo develops, the yolk sac, full of highly proteinaceous food, dwindles and the allantois fills up. 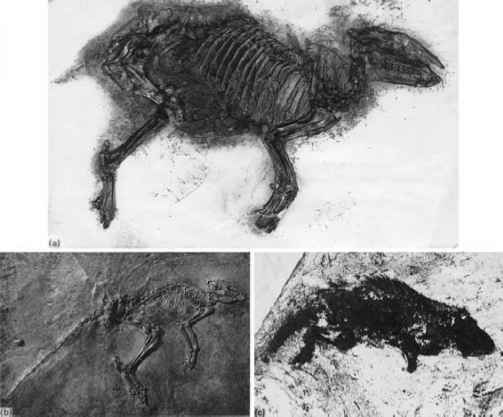 mammals (see p. 114), so the amniotic egg must have arisen at a point in the cladogram below those two early amniotes. Fundamental early splits in amniote evolution are documented in their temporal fenestrae—openings behind the orbit that probably function in reducing the weight of the skull and in conserving calcium. The argument is that bone is costly to produce and maintain, as well as being heavy, and it can be advantageous to dispense with it where it is not required. Much of a skull is under stress from the movements of the jaws and neck muscles,but some spots, in the cheek region and palate, are under very little stress, and openings may appear, and the skull becomes an engineering marvel of struts and braces without reducing the effectiveness of the skull. Fenestrae also provide additional attachment edges for specific jaw muscles, and they allow jaw muscles inside the skull to bulge out. There are four amniote skull types (Figure 5.5(a-d)). (a) Anapsid: amniotes with no temporal fenestrae. Might include early forms such as Hylonomus and Pale-othyris, as well as several lineages in the Permian and Triassic, and the turtles. The clade Anapsida includes turtles, and most of the Carboniferous to Triassic anap-sid amniotes, but several anapsid forms, such as Hylonomus and Paleothyris,are excluded, and others exhibit temporal fenestrae. Fig. 5.5 The four main patterns of temporal fenestrae in amniote skulls: (a) anapsid; (b) synapsid; (c) diapsid; (d) euryapsid. Abbreviations: j, jugal; p, parietal; po, postorbital, sq, squamosal. squamosal. The clade Synapsida includes the extinct synapsids and the mammals. (c) Diapsid: amniotes with two temporal fenestrae, a lower one as in synapsids, and an upper one surrounded by the postorbital, squamosal and parietal. The clade Diapsida includes the lizards, snakes, crocodilians and birds, as well as numerous extinct groups such as the dinosaurs and pterosaurs. (d) Euryapsid: present in a broad range of later am-niotes, especially the marine nothosaurs, plesiosaurs and ichthyosaurs of the Mesozoic. In the euryapsid condition, there is one upper temporal fenestra, surrounded by the postorbital, squamosal and parietal. This pattern probably evolved from the diapsid by the loss of the lower temporal fenestra. Whereas, at one time, it was thought that each of these four skull types indicated an independent and distinct line of evolution, the euryapsid type seems clearly to be a modified diapsid pattern. The fundamental split in amniote evolution (see Box 5.1) took place in the Mid-Carboniferous, into two great clades, the Synapsida, leading eventually to mammals, and the Sauropsida (= monophyletic Reptilia), including Anapsida and Diapsida, which led to turtles, lizards, snakes, crocodilians and birds. What are the development of cleidoic egg in amniote?